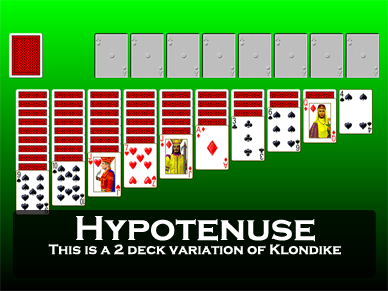 Screen shot of the game Hypotenuse from Pretty Good Solitaire. 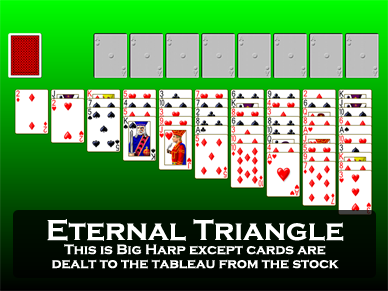 Right Triangle is similar to the games Hypotenuse and Eternal Triangle. 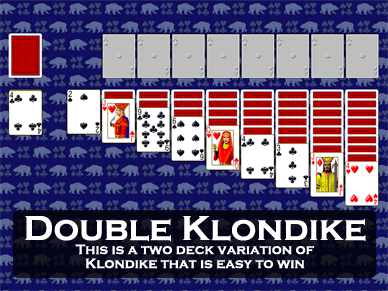 It is a two deck game of the Klondike type. 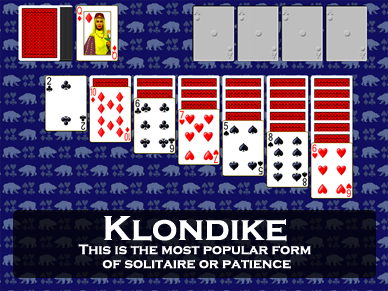 The cards are dealt out in 10 tableau piles in reverse Klondike fashion, with ten cards in the first pile, nine cards in the second, and so on. Only the top card is face up. The remainder of the cards form a stock. Building in the tableau is down by alternate color. Groups of cards in sequence down by alternate color can be moved as a unit. Only a King or group of cards headed by a King can be played in an empty tableau pile. When there are no more moves, clicking on the stock deals one card to each tableau pile. 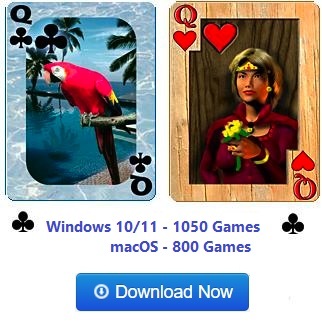 Play is very typical for this type of game, but it is not easy to win, as the dealing from the stock tends to bury needed cards. Up to this point the game is exactly the same as Hypotenuse and very similar to Eternal Triangle. But Right Triangle has an extra bonus at the end of the game that makes it easier to win. When the stock is empty and no more cards can be dealt out the tableau, the stock pile turns into a reserve or cell, with no limit on the number of cards that can be played to it (one card at a time). You can move as many cards as you like to this reserve pile. This means that you can access any buried card in the tableau by simply moving the cards on top of it to this reserve pile. Of course, the trick then is that you need to be able to get these cards back out of the reserve onto the tableau or foundationi in order to win the game. You can only move the cards back from the reserve one card at a time. Always remember when you place a card on this pile that you are going to have to figure out a way to get it back into play later. Since only Kings can be placed on empty tableau piles, this isn't always easy. 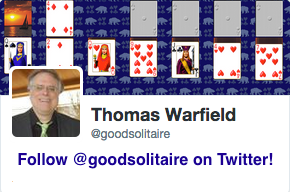 There has to be a place to play the card to get it out of the reserve. Nevertheless with proper play Right Triangle can be won most of the time. It gives a much better chance of winning than the 15% record for an average player of Hypotenuse.